There are four fundamental elements to cooking great steaks; The Cut, The USDA Grade, Extended Aging, and Proper Cooking and Resting. Get these four steps right and you can enjoy the finest steakhouse quality town for a fraction of the price. Read on for details and tips. Cheers! 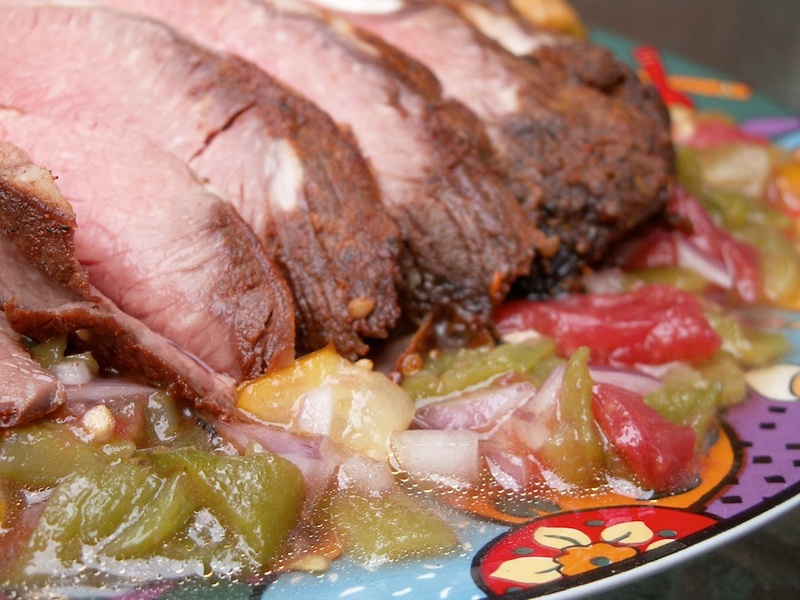 Chipotle Encrusted Tenderloin with Port Wine Sauce – GET THE RECIPE. The best beefsteaks come from the loin and the rib. From the loin we get sirloins, T-bones, tenderloins and N.Y. strip steaks. From the rib we get bone-in rib steaks or boneless rib eye steaks. All these cuts have a slightly different flavor, texture, and marbling level (the white lines of fat that streak the flesh.) They also vary in size, price, tenderness and how they cook. Sirloin is one of beef’s leanest cuts, making it a great choice for the fat conscious cook, though it’s slightly less juicy, tender and flavorful than other loin cuts. Large in size (from 1-2 pounds), moderate in price and usually boneless, sirloin steak is meaty and satisfying, and also great for stir-fry, kabobs and stroganoff. 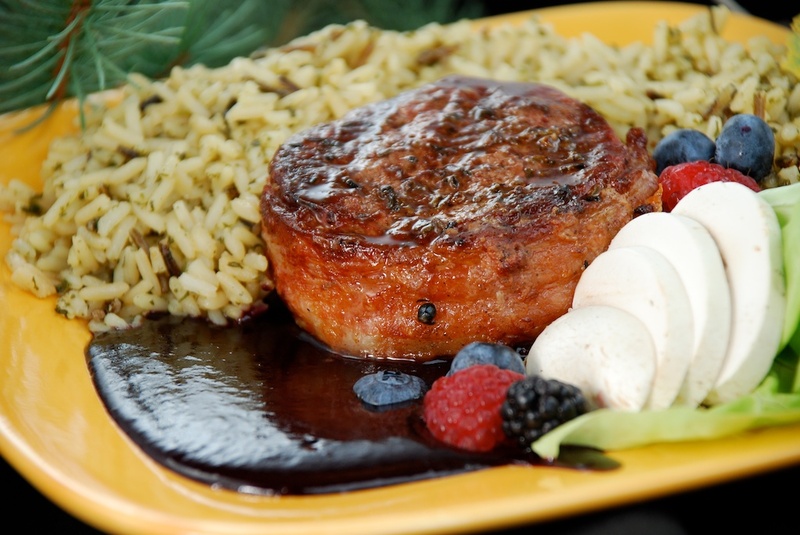 Tenderloin or filet mignon is beef’s most tender, and most expensive, cut. With its smaller size (6-10 oz.) and good marbling, tenderloin steaks are perfect for small eaters and special occasions. Loin Strip Steaks or N.Y. Strips are medium in size (8-14 oz. ), boneless, relatively lean and easy to carve. Juicy, flavorful and tender, strip steaks are one of beef’s most popular cuts. T-Bone Steaks On one side of the T-shaped bone is the tenderloin, and on the other, the strip steak. Large in size (from 1-2 pounds), tender and juicy; the T-bone is a first-class steak. Rib Steak Abundantly marbled, these are the juiciest and most flavorful of steaks. Medium in size (8-14 oz.) and available bone-in or boneless, choose steaks from the ‘large end’ for the greatest marbling and flavor. Value Cuts – There are a host of cuts that offer great taste and tenderness at lower prices which gives the shopper some excellent high value options. These include: flank, flatiron, bavette, chuck eye, skirt, petite tender, newport, sirloin strip and more. Get more info here. The Grading Inspection is designed to assess potential quality. Inspectors evaluate size, animal age, color and most importantly, fat marbling; then assign the appropriate USDA Grade. USDA Prime offers abundant marbling and the greatest potential to yield juicy and tender steaks. Not many beef can achieve this lofty grade (about 2% of all beef in the USA), this is a special product for folks who are crazy about juicy marbled steaks. Available almost every day at Tony’s, we can also special order, age and custom cut a loin or rib just for you at a discount. Because of the higher fat levels I suggest cooking them a little slower than others to avoid flare ups and overcooking. USDA Choice grade is also of high quality, but has less marbling than Prime. USDA Choice steaks represent a wide range of marbling levels from slight to abundant. Think of Choice grade beef as being about medium quality. Top of Choice is a sub category representing the top few percent of USDA Choice beef with the most abundant marbling. Very close to Prime grade, Top of Choice beef is of very high quality, most definitely better tasting than standard USDA Choice beefsteaks. *Tony’s Premium Choice – This is what we cut for our premium steaks, a proprietary blend of Prime and Top of Choice beef representing the top 10-12% of beef in the country. We’re confident you’ll be pleased with these high quality steaks. USDA Select has the lowest level of internal marbling and lacks the juiciness and flavor of higher graded beef. This is the least expensive and lowest quality beef, commonly available under proprietary ‘brand names’ at chain stores and often mechanically tenderized to help overcome the lack of quality. This is a process where quarters or primals are held in a cooler under ideal conditions for extended periods of time. During this aging process, the meat’s own enzymes are the chief agents of change – increasing tenderness as flavor improves. Get more details and specifics on our aging program here. Use ‘Dry’ Heat. 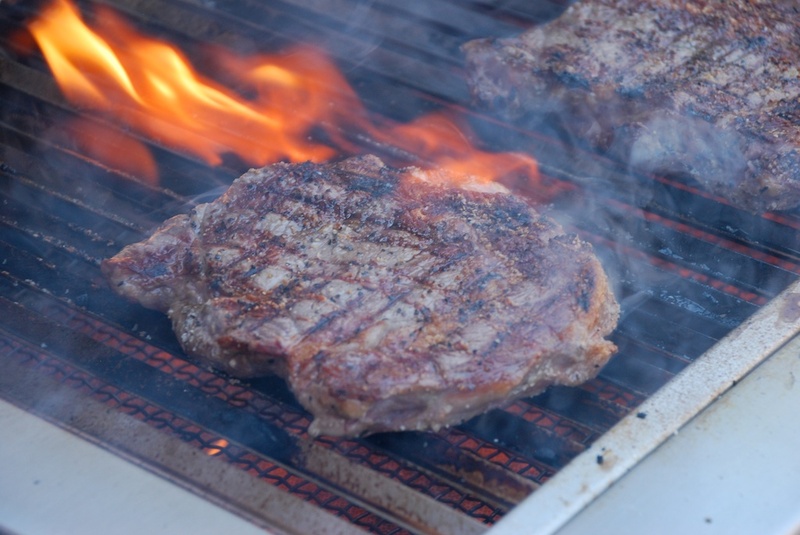 Dry heat from a grill is clearly the best way to cook quality beefsteaks. Even high quality beefsteaks don’t turn out as well when cooked with moist heat; so braising, and pan sautéing is not recommended. This is also why I don’t recommend marinating high quality steaks (value cuts are a different story). Charcoal is the best way to grill, and chunk charcoal offers better flavor than briquettes. For a smokier flavor, add soaked wood chips directly into coals. To get the best results from a gas grill, place soaked wood chips in a chip smoker or bundle of pierced aluminum foil and place below cooking grate, directly over the hottest burner. Once they start smoking it’s time to grill. The best grill surface is one with heavy grates, preferably cast iron, because these grates are what make nice grill marks possible. If you don’t have one, they can be added. I suggest preparing a medium to medium-hot grill that is hotter on one side than the other, the hotter side for searing and the less hot side for slower cooking. I suggest a temperature range from about 300-450 degrees. Remove steak from refrigerator about 60-90 minutes before cooking. 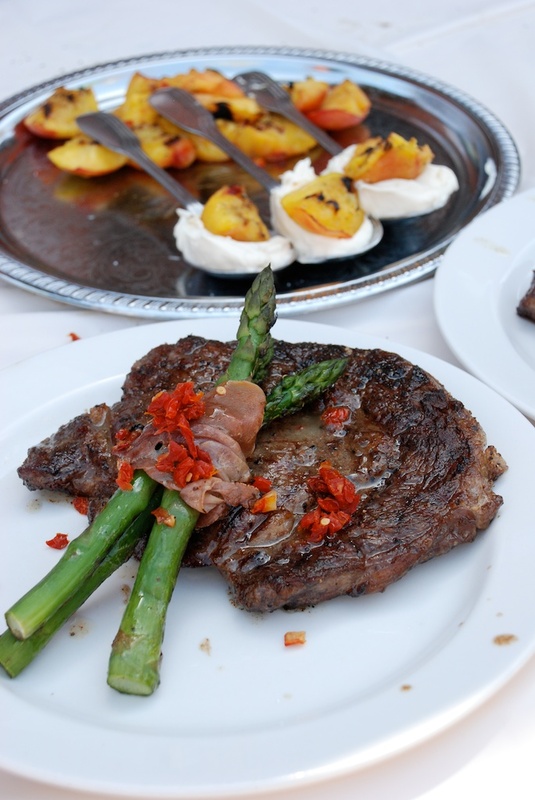 Season steaks as desired – I strongly recommend one of our seasoning blends – pictures of my three favorite at left. Just sprinkle them on, or blend with olive oil and garlic to make a wet rub – delicious! 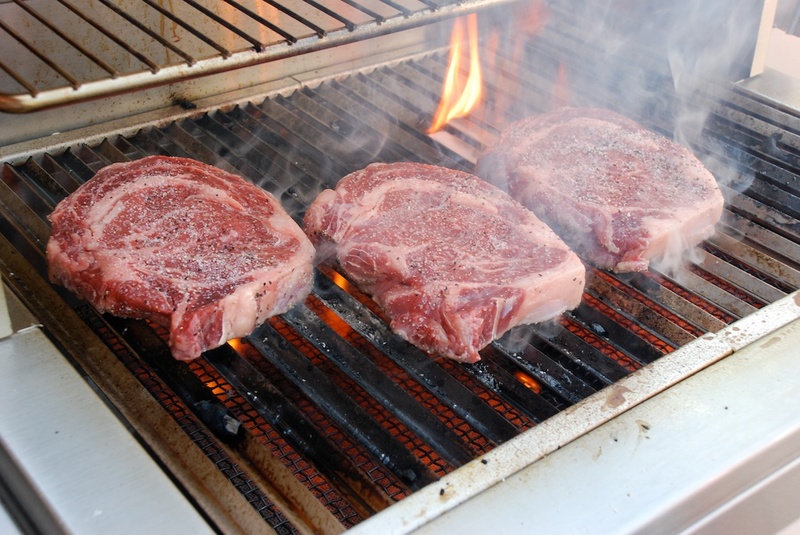 Once the grill is preheated, brush grate clean, mist or wipe with oil and immediately add steaks to the hotter side of your grill and leave undisturbed until well browned on one side – generally from three to six minutes. If a crosshatch pattern is desired, rotate steaks one quarter turn halfway through initial browning time. This is the hardest part of grilling, getting that internal temperature just right – and carryover cooking is the reason. Meats will continue to cook once removed from the grill, generally rising another 5-15 degrees, so the goal is to remove the steak a little underdone. An accurate thermometer is a great tool for this, but with practice you can learn to estimate doneness by eye and touch. If I need the steak just right, I use a thermometer – just remember every time you poke a hole in the steak this allows valuable moisture and taste to escape. The goal is to remove the steak from the grill a little underdone (about 10-15° under) and then to move to a plate, cover with parchment or foil and a towel, and rest for about 10 minutes. This allows the steak to finish cooking and for the juices to settle, remaining in the steak rather than draining on the plate when cut. Resting makes a huge difference, try it, you’ll like it! Please share this with your foodie friends!